Platform W x D: 490 x 600mm. Mesh treads W x D: 490 x 160mm. Fitted with two handles at the front, with knuckle guard hand-grips for lifting. Two fixed 100mm dia. nylon castors. Galvanised or blue epoxy painted finish. Optional factor-fitted inward opening gate.. Note: Gates cannot be retro-fitted, please order with the steps. N.B: If gate required, please order with the steps, as they cannot be retro-fitted. 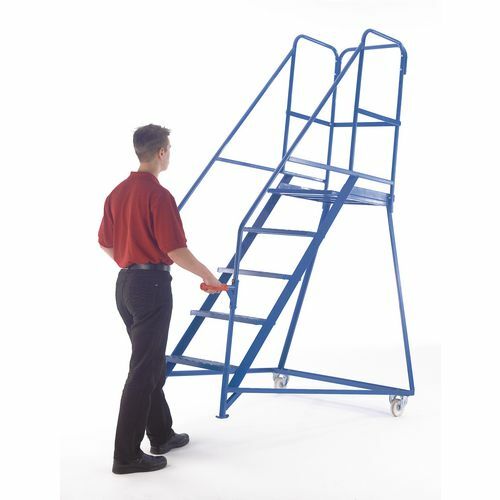 Sturdy and easily movable steps are ideal for working at height, allowing the user to work at height in different places within premises. Our DGUV tested tilt and push steps offer an excellent solution for working at height. 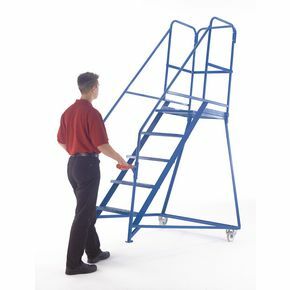 They are fitted with two handles at the front with knuckle guard hand-grips for safe lifting and manoeuvring. Moving the unit is so easy with two fixed nylon 100mm diameter castors to the rear of the steps. The splayed legs provide extra stability while the large working platform gives the user plenty of space to work from. To ensure you can be confident about the quality of these products they are made and approved to EN131 part 7 and DGUV tested. There are four platform heights to choose from; 750mm, 1000mm, 1250mm or 1500mm and they come in a galvanised or painted finish, depending on your preference. Our DGUV tested tilt and push steps are easy to move and provide great stability for the user. They come with a 12 month guarantee and FREE UK Delivery. Galvanised or blue epoxy painted.